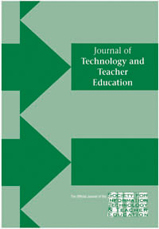 The impact of a redesigned educational technology course on preservice teachers’ knowledge and skills with regard to information and communications technology as defined by ISTE’s National Educational Technology Standards for Teachers (NETS-T) was investigated in this study. Two changes were made to the course: (1) a commercially available technology assessment aligned with ISTE’s NETS-T was administered, and (2) students completed observations of a technology-rich classroom. Results indicated that the preservice teachers made significant progress in technology knowledge in all five standard areas of the NETS-T; however, some performance indicators of the standards may not have been adequately addressed in the course. Student reflections from the observation experience provided evidence that preservice teachers found it helpful for their future teaching. Although the majority of preservice teachers agreed that the observations were beneficial, a few preservice teachers had concerns about the integration of technology into lessons, especially when trying to determine if technology integration is necessary, dealing with unexpected technical problems, managing the classroom, and assisting children with special needs. Kovalik, C., Kuo, C.L. & Karpinski, A. (2013). Assessing Preservice Teachers' Information and Communication Technologies Knowledge. Journal of Technology and Teacher Education, 21 (2), 179-202. Waynesville, NC USA: Society for Information Technology & Teacher Education. Retrieved April 25, 2019 from https://www.learntechlib.org/primary/p/40634/.